The Blizzard Hard Candy is an horizontal flow pack wrapping machine to produce 3-seal packs starting from a reel of heat or cold-seal film. The machine has been designed for high speed wrapping and for working schedules up to 24 hours a day. Hard round, square, oval and spherical candies. The machine is powered by brushless motors in direct electrical axis. Automatic heated disk feeder with reverse-turning plate. The control depends on independent motors. 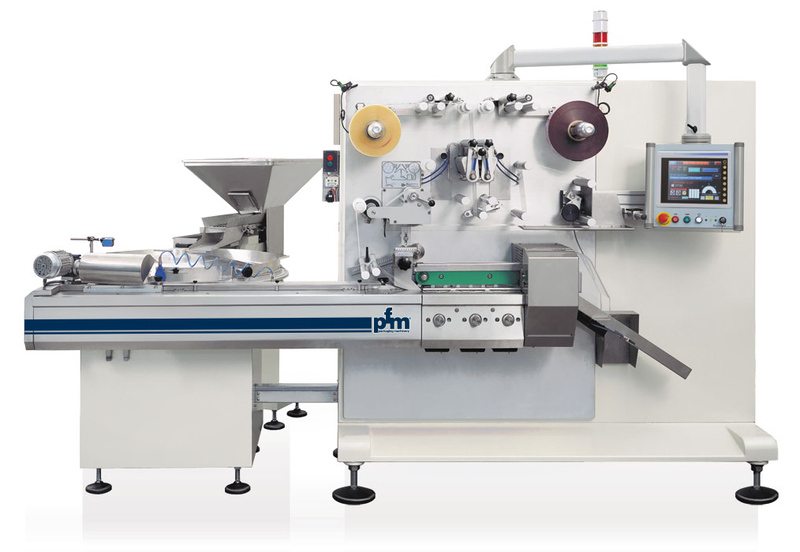 There is the possibility to change the timing/synchronisation with the wrapping machine according to the product dimensions, the wrapping speed and the ramp of acceleration or deceleration. This system optimised by PFM allows to largely increase the average production of the machine and to remove any unnecessary stop. Cantilevered construction: it makes the cleaning operations easy. In front there are only the sealing assemblies while the mechanical and electrical components are at the back of the machine in separate and guarded environments. Therefore, all impediments for a perfect cleaning have been removed. Automatic reel splicer: without reducing the speed of the machine. Maximum efficiency and, moreover, all preliminary operations are made extremely easier. Power slip rings and gold temperature control for a perfect conductibility of the signal. PFM Tele-assistance system: the control unit of the machine functions is inter-faceable via modem with PFM service department.